Kashmir Great Lakes trek is set in an almost heavenly arena of high mountain vistas, endless pasture lands, and of course, the great lakes. Arguably the best way to witness the beauty of the Kashmir Himalayan region, you will be rewarded with a palette of colors every single day that you walk on this trail. This adventure in paradise starts and Sonmarg away from the tumultuous political climate of South Kashmir. 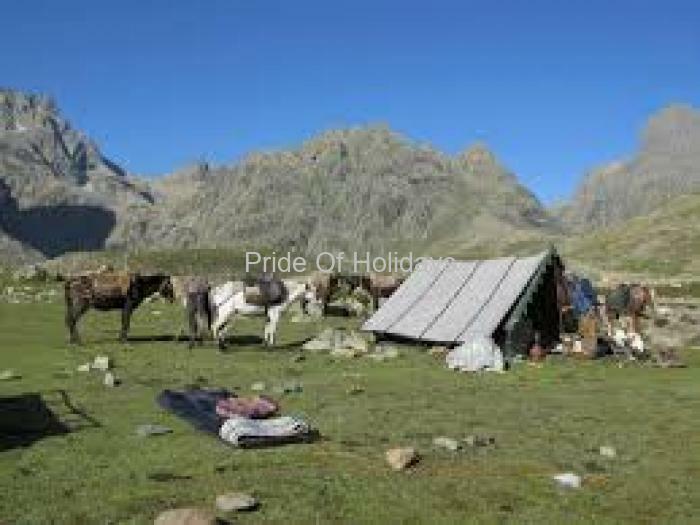 The trek is moderate but goes over high 13000 ft high passes, but the relaxing terrain, deep blue colored mountains and lush flower filled meadows make the going extremely pleasant. You may get to experience a few cultural insights. Local shepherds, their herds and families may be your trail companions. There is color everywhere. 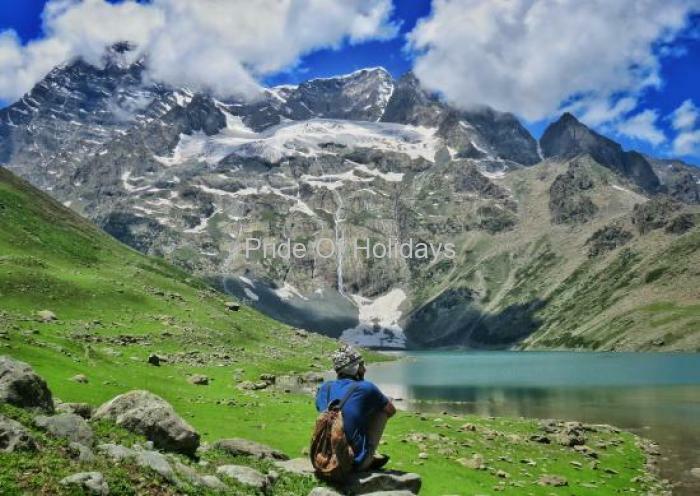 The Great Lakes of Kashmir trek will lead you to its turquoise blue-green lakes, climbs over high altitude passes and offers you one of the best trail experiences you will remember for a lifetime. Today will be first day of this enthralling Kashmir short trek! After having breakfast at the guesthouse, start with a 3-4 km trek from the Sonamarg and reach a roadside eatery, from where you can bag up all the required commodities for the day. Here onwards, the trek will be a gradual one and alongside the Sindh River, it will take you through maple and pine forests. Completing the hike through the forests, you will be rewarded with the stunning views of the Sonamarg Valley and pictorial streams. Here onwards, the trek will descend down and will take you to the snow-covered Shekdur Range. Relax around the vicinity for a while before you start trekking towards the Nichnai, which is located at around 11,500 ft above the sea level. Upon arrival in Nichnai, check-in into the campsite; dinner and overnight stay in the camp. Starting early in the morning; around 08:00 AM, start the trek towards the Nichnai Pass and enjoy the stunning views of the lush valleys and the untouched beauty of the region. Hereafter, cross the river and continue hiking through the banks of the river and arrive at the Nichnai Pass or the Vishansar Berry. Arriving at the pass, which is located 12,767 ft above the sea level, witness and enjoy the meticulous beauty of the pass and the snow-covered peaks all around it. Hereafter, the trek will undergo a steep descend and will lead you to a pictorial meadow of colorful flowers; while on this trek, you can also catch glimpses of a cascade that finally joins a river. Here onwards, continue with the hike and upon arriving a flat valley, continue towards its end and arrive at the campsite. Gazing on the left of this trail, you can also behold captivating views of the Himalayan Range and also the Vishansar Lake; overnight stay in the camp. Day Details This day of the Lakes in Kashmir Trek would be a light one as you acclimatize yourself to the weather and rest at Vishansar and visit to Krishansar Lake; overnight stay in the camp. You may visit Kishansar lake, which is at approx 1 and half kms from our camp site. This chilly morning, witness the Kishansar Peak casting its reflection on the azure lake waters. Start the trek for the day towards the lakeside and reach the Kishansar Peak, which is situated around 500ft above the campsite. Here onwards, ascend to the other side of the water reservoir. The trek till here comprises of both easy and tough terrains. 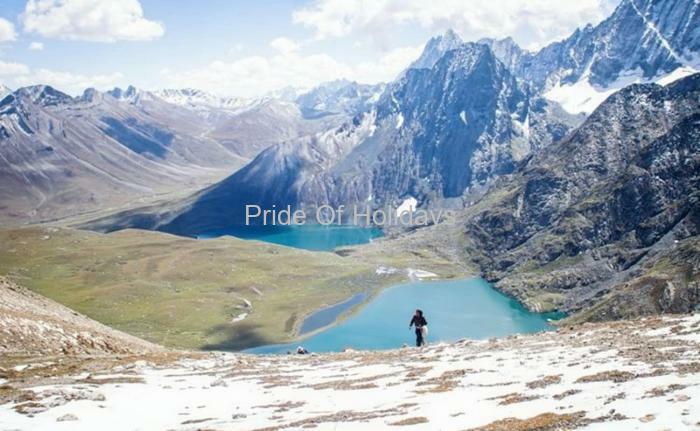 Later part of the day, trek towards the Kishansar Lake and and finally make it to the Gadsar Pass that is perched at a height of 13,800 ft and is the highest point of this trek. From the pass, pass through a flowery meadow and some of the pictorial lakes; Yamsar is one of these lakes. From here, continue with the descend and after crossing Iris, reach the Gadsar Lake. A picturesque lake, it is adorned with the stunning beauty of exotic flowers and snow on both the sides. Arriving at the lakeside, report to the nearest Army Camp and complete the formalities of getting permission to pass Gadsar; ID proofs are a must for this. Your day will begin with a walk from the army camp towards the stream. Brace yourself for varied terrains from super steep, flat and even land. Take a short break at Maengandob that is fringed by mountains. Reach the first of Satsar lakes, which is a group of seven different lakes and follow the same procedure of yesterday with the army officials and set camps near the surreal first lake of Satsar. A true test of caliber, this is the day when you will have you push your physical and mental limits! Trudge through rocks and boulders ridden terrain, pass the last of the Satsar lakes, and start hiking downwards for half an hour till you arrive at the forest line. Here onwards, start ascending upward and reach an altitude of 13,400 ft; during this climb, you can witness several ridges at different heights and the quaint Gujjar huts as well. From the summit, you can also behold the fascinating views of the twin lakes: Gangabal and Nundkol, that are connected to each other by a picturesque stream and are known for trout-fishing. Post this; trek through a sharp and rocky trail and make it to a gurgling stream, passing which, you will reach a lush meadow that advent towards the Nundkol Lake, which is also a popular weekend getaway among the locals. Trekking for around 20 minutes from the Nundkol Lake, you will finally arrive at the Gangabal Lake and by crossing the bridge across the lake; you will arrive at the campsite; dinner and overnight stay in the camp. 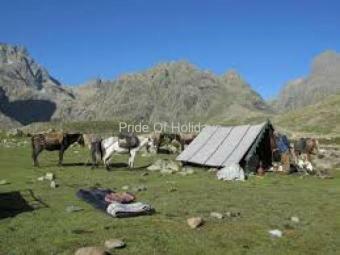 07 Nights accommodation at Mountain in Tents. Trek equipment's like Sleeping bag, mattress, tent, kitchen tent, toilet tent, trekking permits, first aid medical kits and oxygen cylinder.